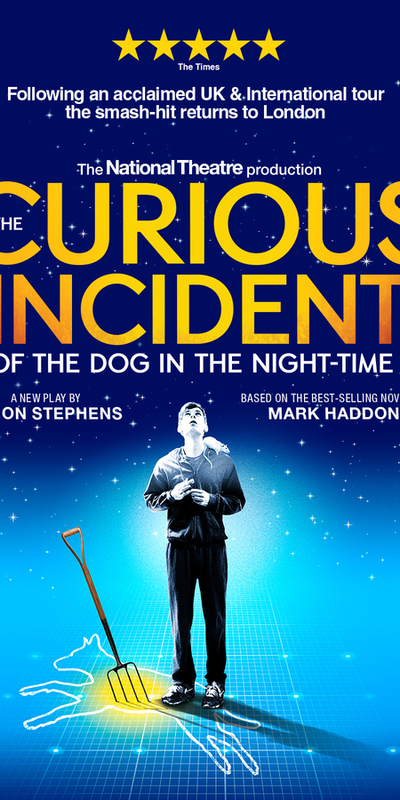 Enjoy our 3-course Formule Menu with a glass of wine and a Band A ticket to The Curious Incident of the Dog in the Night-Time at the Piccadilly Theatre, for £59.50. Adapted by two-time Olivier Award-winning playwright, Simon Stephens, and directed by Olivier and Tony Award-winning director, Marianne Elliott, Mark Haddon's best-selling novel is brought to life on stage and has won 7 Olivier Awards and 5 Tony Awards including 'Best Play'. Since its first performance, the show has been seen in 9 countries and 78 cities world-wide, most recently completing an acclaimed international tour to cities including Amsterdam, Toronto, Hong Kong, Singapore and Melbourne. 2. Shortly after booking, you will be contacted by Brasserie Zédel in order to confirm your table reservation at the restaurant. Please ensure that you have your meal voucher, which will be sent with your tickets via post or given to you at the box office, to show on arrival at Brasserie Zédel. - Valid for Monday - Thursday 7.30pm performances, until 27th April 2019. - This offer includes: a ticket to the play plus Brasserie Zédel's Menu Formule (3 courses with a glass of wine and water). Service charge is included. - There is no cash alternative available to any elements of the package. - Anything ordered outside of this set menu will be charged as normal at the end of your meal. - Alcohol will only be served to over 18s; a soft drink alternative is available. - Table reservations in the Brasserie must be made at least 48 hours in advance.